Spaghetti carbonara is a classic pasta dish that the whole family loves and that takes as long to make as it does to cook the pasta. The ingredients are simple: Pasta, bacon, egg yolks, Parmesan cheese, a little olive oil, salt, and pepper. A silky sauce is created when the beaten yolks are tossed with the hot pasta and a little fat from the bacon. 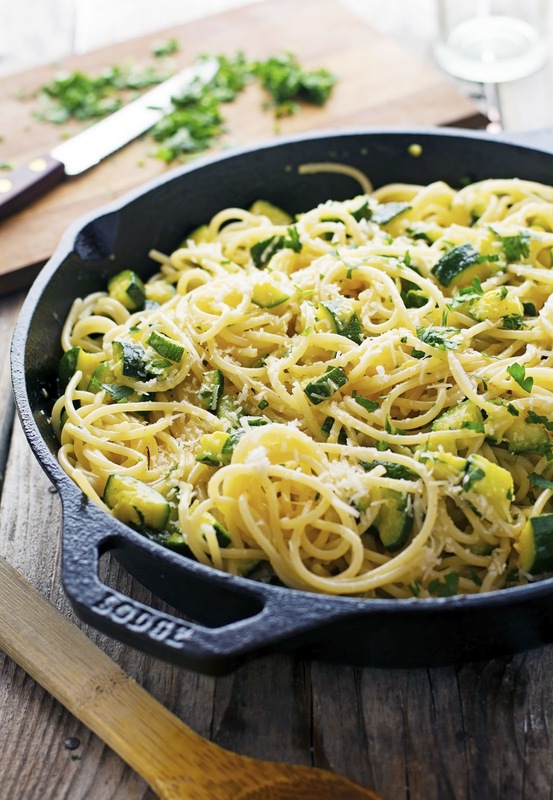 Luscious and wonderfully indulgent, pasta carbonara is as good as it gets. Can I be totally honest with you guys? 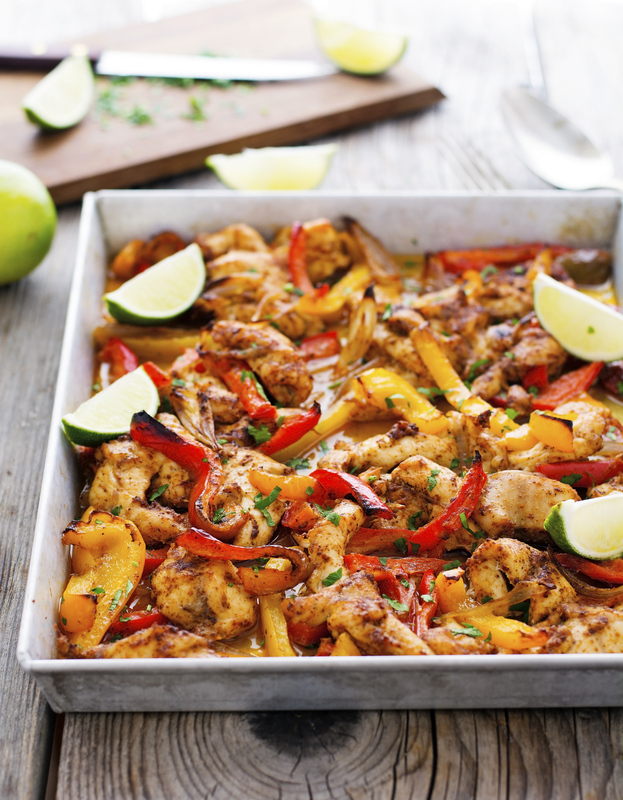 I am in love with this Easy Baked Chipotle Chicken. So much so that I made a second batch of it the day after devouring the first — which was like two days ago. Speaking of which, I think the time has come to whip up another one because seriously, this is smoky spicy awesomeness. Did you know that saltimbocca literally means “jumps in the mouth”? That description could not be more fitting for this classic Italian restaurant favorite: the dish is so delicious people you cook it for won’t be able to eat it fast enough. In this version, chicken replaces traditional veal and instead of pan frying it, it’s roasted in the oven. But the mouthwatering addition of prosciutto and sage stays the same and makes the the dish practically irresistible. 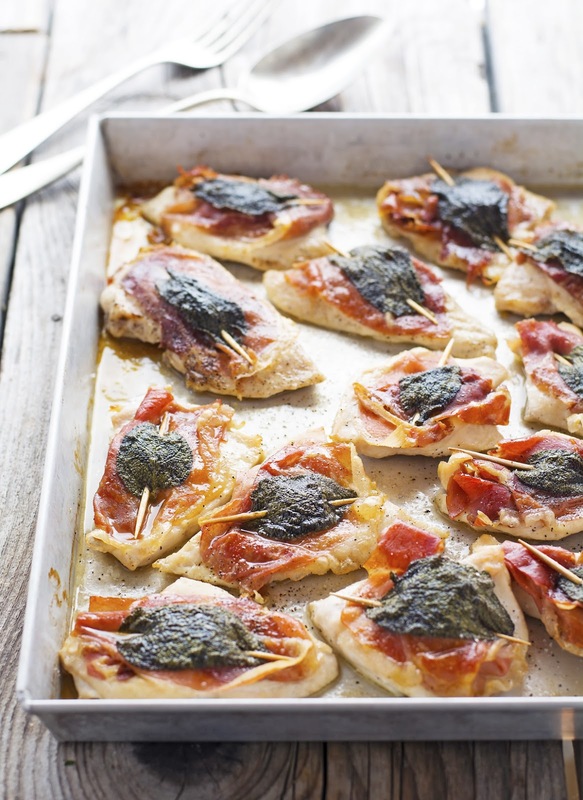 These Pan Sheet Chicken Saltimbocca take minimal effort to make and are ready in just 30 minutes: simple, delicious, and just one pan in the sink to wash up. It’s my special dish for Niece every time she visits. Pure perfection. Serve it over spinach or better yet, with roasted fingerling potatoes that you can pop in the oven while the saltimbocca are cooking. I can’t seem to make too much — we finish however much there is. There’s no overloading of ingredients (just seven, if you count also salt and pepper), the perfect complement of flavors, super simple execution, and minimal dishes to wash: what could you possibly want more? 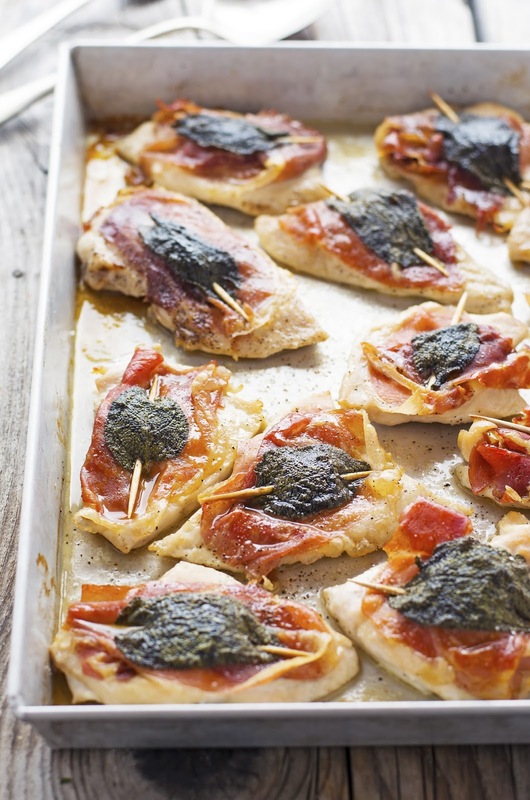 Pan Sheet Chicken Saltimbocca Print this recipe! 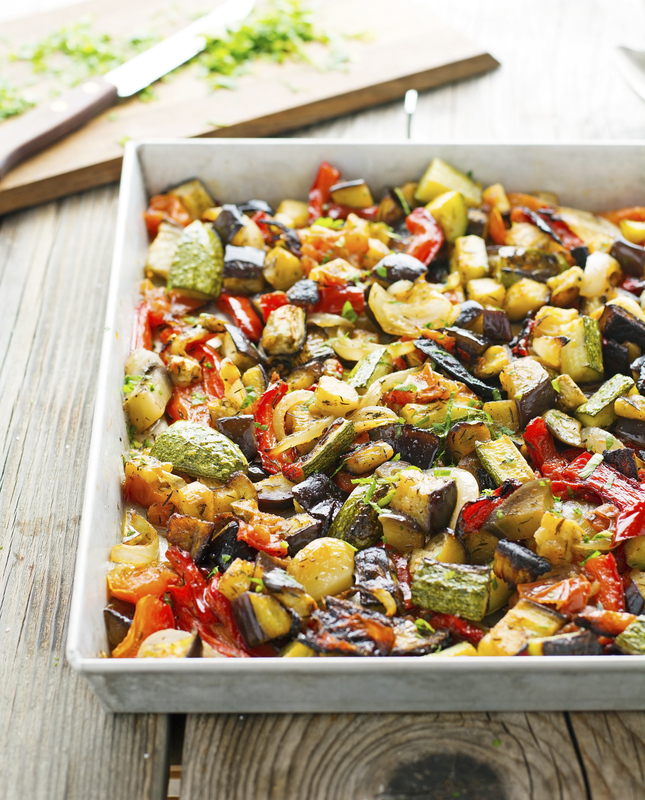 Grease a large rimmed baking sheet with olive oil and set aside. Season chicken cutlets with salt and pepper. Top each cutlet with half prosciutto slice and lay a sage leaf in the center of each cutlet. Weave a toothpick in and out of each cutlet to secure the prosciutto and the sage. Place cutlets on the prepared baking sheet and roast in the oven for 10 minutes, flipping halfway through. 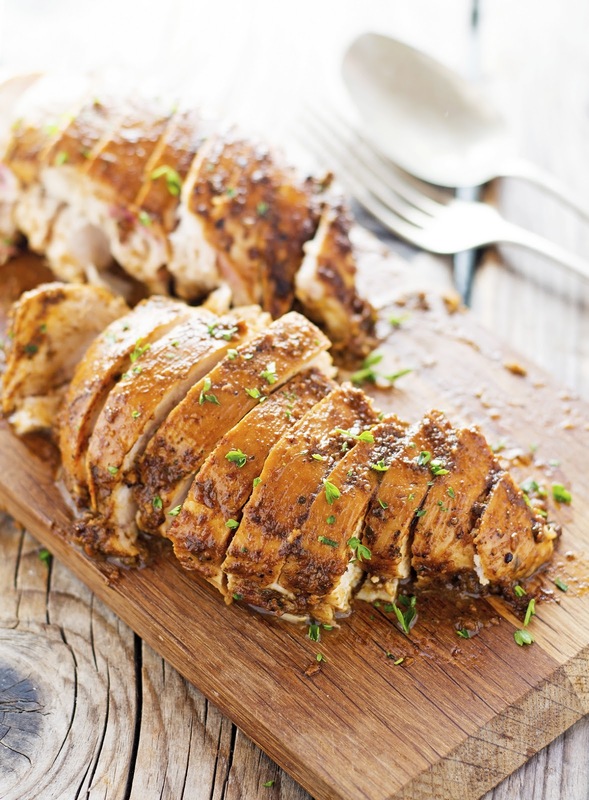 Remove baking sheet from the oven, pour white wine over the cutlets and roast for additional 10 to 15 minutes or until the chicken is cooked through and the wine has reduced to a flavorful and distinct sauce. 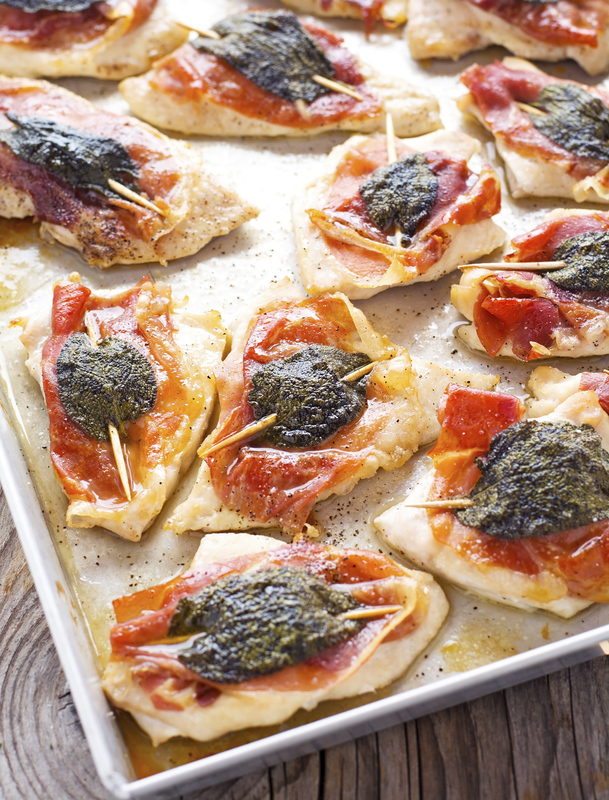 One serving (i.e., four saltimbocca) yields 375 calories, 18 grams of fat, 0 grams of carbs, and 48 grams of protein. I can’t believe how well this worked out. I also can’t believe I made this quintessential stove top hearty dish in the oven. But I can believe I’ll be making this again tomorrow, because it’s delicious and an incredible cinch to make. Can we please discuss for a moment the price of supermarket veggie burgers? Why are they so expensive? One can argue that this happens because veggie burgers are made with a lot of ingredients. Or maybe it’s because vegetarians are willing to pay more to avoid beef/pork, the manufacturers know this and thus charge more. 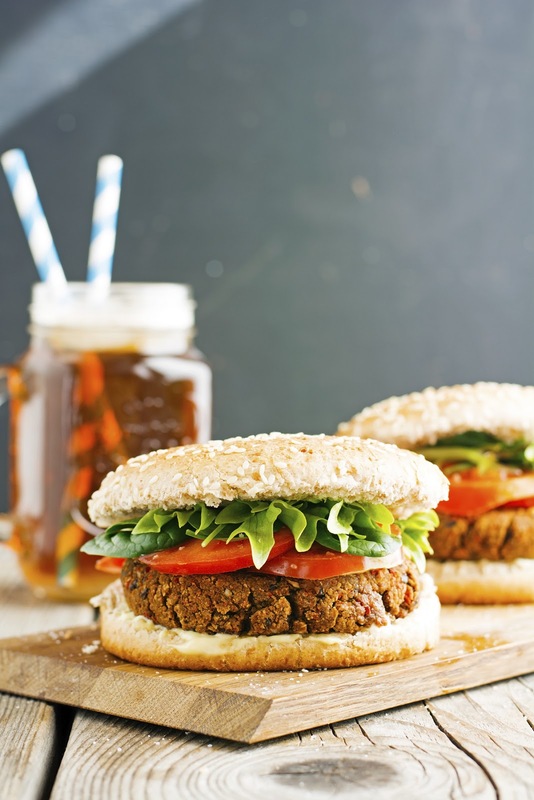 More likely is it because the production of veggie burgers is on a much smaller scale if compared to the beef counterpart and in addition vegetables and grains — though generally quite cheap pound to pound — are seasonal and can greatly fluctuate in price. Whatever might be the reason: veggie burgers are expensive! I don’t know if there is a name for this but when I see a recipe that sounds intriguing, I have this bad habit of cooking it either right-that-very-moment or pretty much never. I do the same with clean laundry, I either get every single thing into its proper closet/drawer or it sits on my bedroom chair for days — never bothering to put it away. Same thing happens when I buy something I’m not sure of, I either return it the very next day or it stays in its bag forever. The fact is, once something leaves my short-term memory, it may as well be lost eternally. But with recipes, at least today, I’m on a rescue mission.